Discuss 6 foot facts and information about feet pertinent to health-fitness professionals. Describe biomechanical imbalances and explain corrective exercise for three Case Studies. Identify 9 bones associated with the 3 parts of the ankle/foot. Identify three joints associated with the ankle/foot and explain function and movement/ triplanar movement at these joints. Identify and explain the basic function of 10 extrinsic muscles found in the 4 compartments of the foot/ankle. Identify and explain the basic function of 9 intrinsic muscles of the foot/ankle. Describe movement in 4 planes and 3 axes relevant to the foot/ankle. Discuss how deviations from functional norms contributes to 4 foot types and explain how they are responsible for a variety of proximal biomechanical imbalances affecting the knee, hip and lower back. Describe a closed chain and open chain assessment for the foot/ankle. Discuss conditions associated with foot posture as associated to knee and hip pain. Identify and discuss 2 types of limb length discrepancy. Explain corrective exercise for the pes planus and pes cavus foot types. 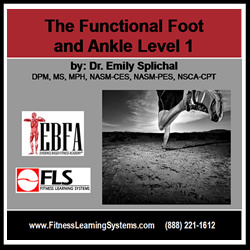 Identify 9 pathological considerations related to foot structure and biomechanics and discuss fitness considerations for each.